There are literally hundreds of presentation tools in the market today and keeping track is getting increasingly hard. Most of them have been optimized for a specific purpose or type of user and it’s very likely that THE ideal tool for you is actually one that you’ve never heard of. We’ve created this list of the best presentation software to shed some light and to give you a comprehensive presentation software list to ensure you make the right call in the platform you select. This article is the result of several weeks of research and review of 50+ presentation tools currently available on the web. Definition: What is presentation software? A text editor: to input the contents of the presentation. 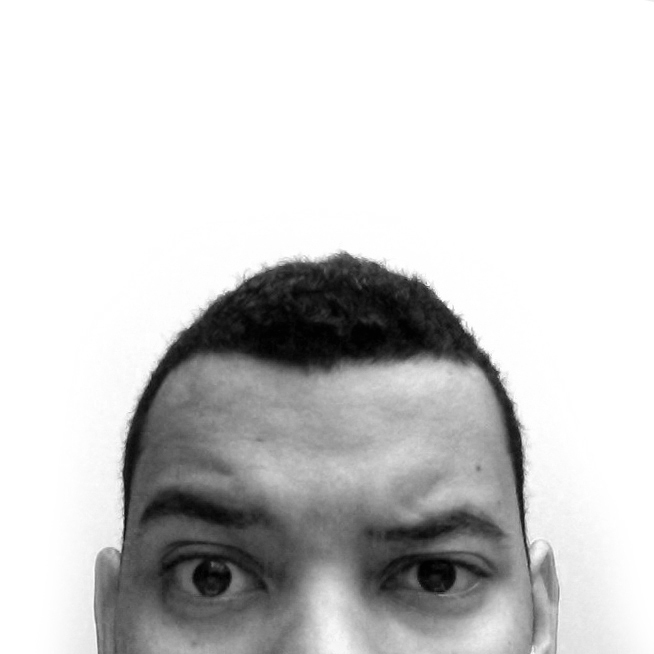 An import function: to insert and manipulate images and other content. A slide-show or presenter mode: that displays the content in a nice, formatted way. Slide shows often consist of a combination of text, video, images and charts. Their primary function is displaying clear, readable and summarized data to an audience. 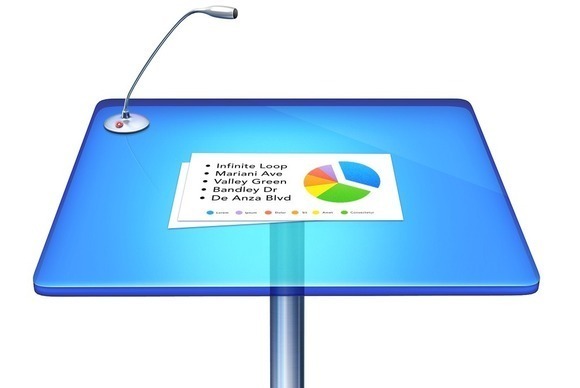 Most presentations are shared and presented on a larger screen or through a digital projector. In rare occasions, slide presentations are printed out as a replacement for text documents, but this is a really inefficient way to review data, that Garr Reynolds calls ‘PresDocs’ (Garr Reynolds is the author of Presentation Zen, one of the most important go-to reference for successful presentations). WHAT MAKES A GOOD PRESENTATION TOOL? The functions and results of presentation programs has evolved significantly in the past decades, since the original launch of ‘Presenter’ (the PowerPoint predecessor) in 1984. In 1987 PowerPoint 1.0 was released for the Macintosh and it started a revolution in the way we prepare and consume content in meetings. This rating looks at the learning curve, or time required to learn to use the platform. An easy to use interface is fundamentally important to ensure that users feel confortable working with the platform and doesn’t require complex training to take advantage of its features. This also accounts for the average time it takes to build a presentation. The ability to customize a presentation to the smallest details. This varies depending on the number of advanced features in the platform, like the ability to set different transitions to each slide, the ability to add customized elements or to design/code the final outcome of the slides to the last font size and color code. This indicator looks at the outcome of a finished presentation, assuming the user is an average person with basic design skills and intermediate knowledge on the tool itself. 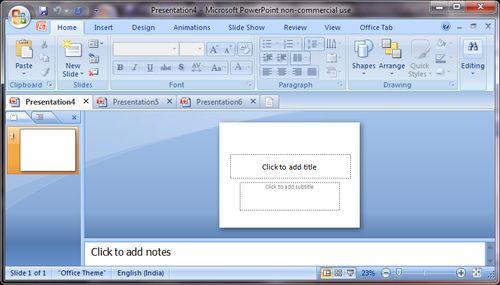 As we mentioned before, PowerPoint is the most used presentation builder in the market today. It is distributed by Microsoft as part of their Office Suite, which is estimated to have over 500 million users worldwide. Microsoft has also revealed that approximately 35 Million presentations are delivered every single day, that’s a staggering 400 presentations per second. For this section, we summarize the top PowerPoint alternatives, that is, presentation tools that work in a fairly similar manner and that provide similar (but significantly better) results. If you are an avid PowerPoint user, then migrating to these platforms should be rather easy for you. Ease of use: ★ ★ ★ ★ ★ - Fantastic! Final result: ★ ★ ★ ★ ★ - Fantastic! 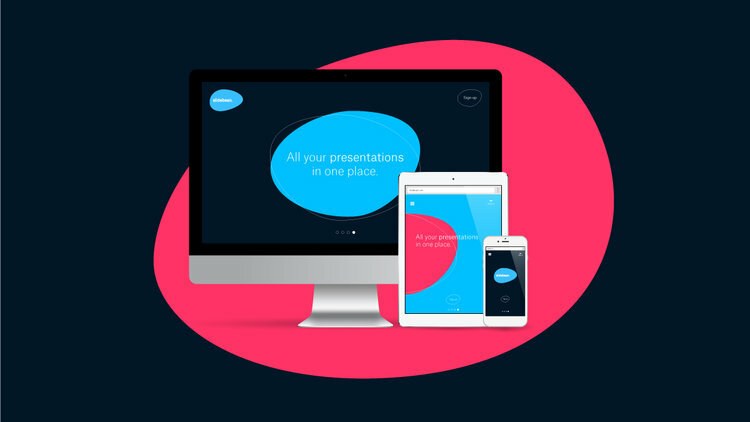 Slidebean is an online presentation tool focused that lets you add the content, and automatically converts formats it into beautifully designed slides, allowing you to create a professional presentation in a fraction of the time it used to take on PowerPoint. When comparing it to PowerPoint, Slidebean’s interface is easy to learn and it lets you create fantastic looking presentations very fast. Their platform web based and allows both PowerPoint and direct to PDF exports. Customization: ★ ★ ★ ★ ★ - Fantastic! Keynote is what PowerPoint should have been all along. Apple’s version of the popular presentation tool has improved significantly in the last few years, and has recently included a cloud version that works on any browser on any computer (as long as you have at least one Apple device). Keynote is basically an improved PowerPoint, it offers the same approach to create slides, but offers nice and clean templates, a simple interface and nice details like smart guides. The biggest issue with Keynote is the long learning process that it requires. Similar to Microsoft’s tool, you’ll need to sit down for a few hours to learn to use the platform, and another larger set of hours to make a professional presentation. Visme is a web based platform for building presentations. Their interface is similar to PowerPoint, but they have successfully simplified a complex UI to a nicer and more understandable navigation. Still, you’ll need to spend a few hours to get a good grasp of where all the customization options can be found. 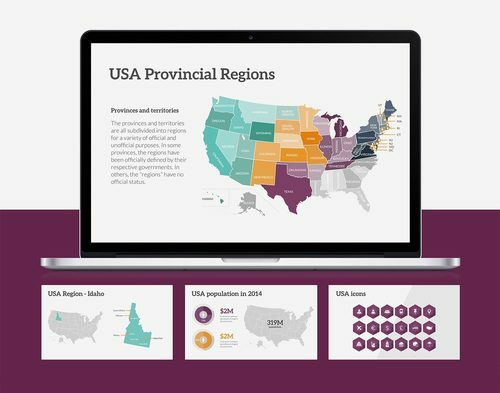 The platform offers an interesting (but certainly limited) gallery of images, but they succeed at delivering beautiful infographic elements (which they call ‘Charts and Graphs’) that you can use to add some color and make your slides much more dynamic. The growth and penetration of Macs is at its peak and is expected to increase in the upcoming years. Apple’s focus on an easy user interface is often embraced by the developers working on apps for Mac OS. The following programs, we believe, best leverage the advantages of their platform, including availability on the Mac App Store (for easy installation) and support for Retina Displays. 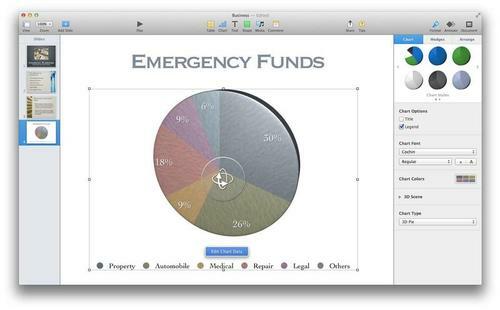 If you own a Mac you’ve probably played around with Keynote. 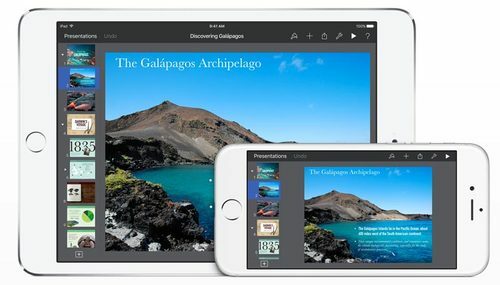 Their seamless integration with new features like iCloud Drive, iPhone Remote App and and Retina Displays makes this platform a great option if you’re building presentations on your Apple computer. The only takeaway aside from what we mentioned above is compatibility. Keynote presentations can only be opened by Apple Keynote and while they support PowerPoint exports, the look and animations can change drastically when doing so. More info about Apple Keynote is available here. The team at Slidebean has developed the platform taking Retina-sized screens into account and they’ve been operating on a Mac-only environment for over 2 years! The platform is completely cloud-based it will work anywhere from your Mac to your iPad, and your presentations will always be in sync. The team has also announced its intentions to work on a complementary desktop application for the Mac. 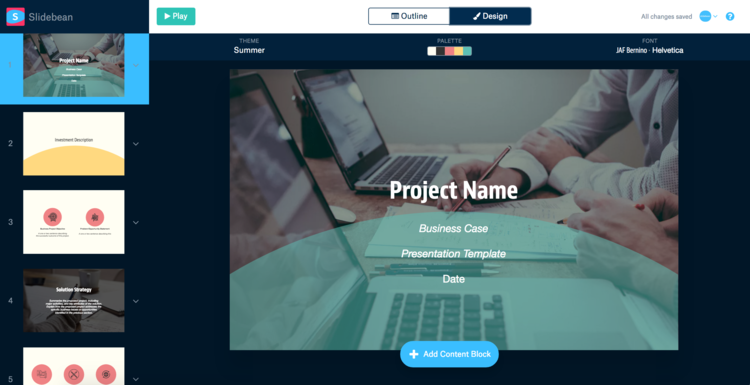 Slidebean lets users create presentations in minutes, taking advantage of dozens of pre-filled presentations templates where you only need to fill in your content. Then, automatic formatting templates are applied to your content, ensuring that your slides look great and that the format is transferred exactly identical on any computer where you open the slides. 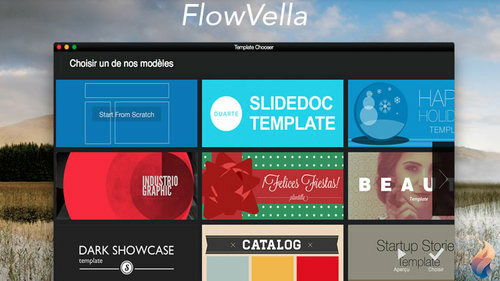 Flowvella is available on the Mac App Store as a desktop application. It provides a simple interface (certainly cleaner than Microsoft PowerPoint and somewhat similar to Apple Keynote) and some very nice design templates, which set good grounds so you can start building a nice looking set of slides on top of them. This is by far their biggest strength! If you want to start from scratch, however, you might feel a little lost creating something that looks good. We found, however, that the oversimplified interface makes some basic options hard to find, like changing the color of a shape. Also, while running as a desktop app it still requires an Internet connection to download some elements, which can lead to a slower performance than a 100% desktop tool. Update: We also read recently that they launched a tvOS app for the new AppleTV, making them, as far as we know, the first presentation tool to leverage the new platform. 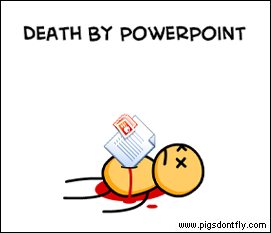 While the Microsoft Office suite has total dominance over systems built on Windows (as a matter of fact it comes preinstalled in many devices), users are turning away from PowerPoint in search for more efficient presentation tools, that give them better results with less effort. Well, no surprise here. PowerPoint is truly the most widespread presentation tool and it’s very likely that it comes preinstalled in your Windows PC. We’re not going to linger a lot here, we’ll just assume you’re familiar with PowerPoint’s strengths and limitations. SlideDog is a nice Windows application that basically aggregate the content of a presentation and automatically plays it for you. 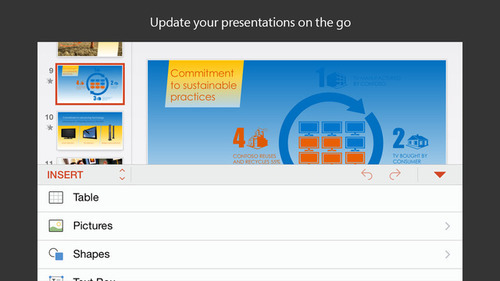 You can import PPT files, videos, photos and even PowerPoint files and SlideDog while play them for you. 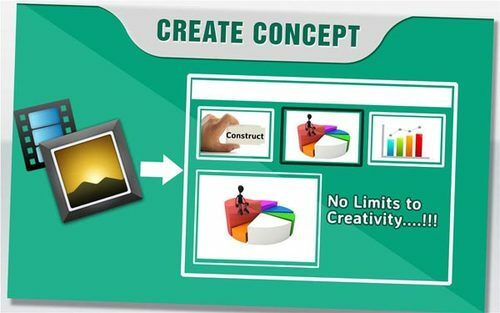 While their platform provides a nice presenter tool, it lacks its own slide builder, so you are still forced to create your presentations in PowerPoint or whatever tool you choose to use. 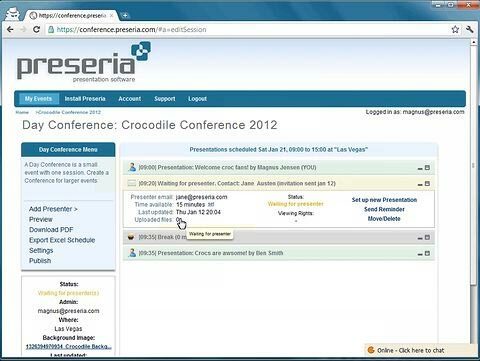 Preseria is a tool to organize conferences and manage the presentation files sent by speakers. It lets you keep all of your speakers presentations in one place and provides you with an interface to project and present their content at your conference. Since their platform doesn’t allow you to modify the content, we are not rating this platform using the variables we mentioned above. Improve Presentation is a presentation template service that sells PowerPoint templates for various purposes, for prices ranging $29 to $49. Basically, you pay for a pre-designed template that you download and open directly in PowerPoint, and then you can start building your own slides on top of it. This platform is not a presentation tool itself, but they do have a big selection of presentation templates for anything from startup pitch decks to marketing decks. Linux users have a preference for Open Source presentation software and we’ve taken that into account to come up with the following list. 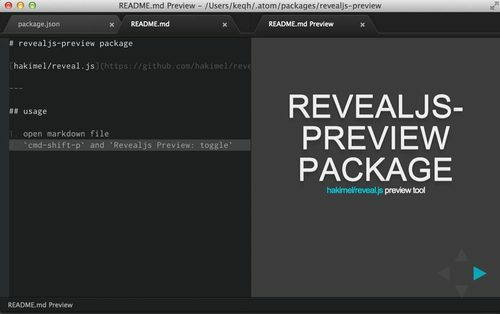 Reveal is a sweet Framework that lets you code nice presentation; think if it like a Bootstrap for slides. While coding skills are required to build your decks, we found the instructions to be rather simple, so if you have some basic HTML skills you should be fine. You can download the framework here. Not a lot to explain here, the PowerPoint version of Open Office is identical to an older PowerPoint, so it has some limitations compared to the new 2016 versions. Productivity is starting to go mobile. Many applications like Google Inbox and FlyLabs have successfully transferred stuff that we used to do on Desktop computers to an extremely efficient smartphone approach, and have even come to replace their traditional counterparts. The reality with mobile productivity is that we cannot expect every single task to be more efficient on the mobile phone. Keyboard usability for example, will continue to be more efficient on a desktop device than on a phone, and not every interface designed for a mouse/trackpad can be converted to a touch UI without sacrificing some efficiency. I personally believe that as dictation features and voice recognition gets more efficient, people will start to migrate to dictated functions in that manner, but it’s not a change that we are going to see happen overnight. A number of startups have focused on mobile-first efforts, the most notable is likely Haiku Deck, that launched their mobile app in 2010. While offering simpler interface, it’s still harder and more time consuming to use the app on the iPad, which means that naturally people will prefer to continue working on their computers whenever they have the chance. The mobile version of Slidebean is one of the best presentation builders that you can use on your phone. This platform lets you add the content, and automatically converts formats it into finished slides- reducing the need for complex interfaces that would overcrowd your iPhone screen. 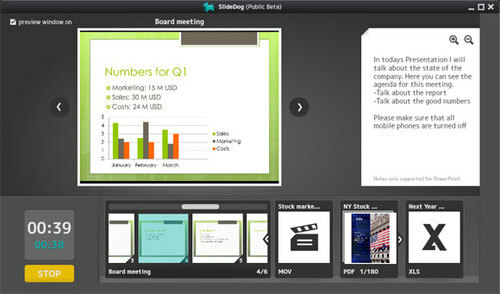 Any presentation built and shared on Slidebean is also visible on any mobile device, allowing you to share and even present using your mobile phone. Haiku Deck launched as an iPad app in 2011. They made a big bet towards mobile productivity and came up with a solid iPad application that allowed you to create slides in less time than the then-only alternative of Keynote for iOS. 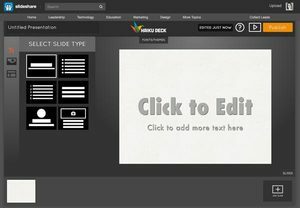 Haiku Deck has a nice set of templates that you can use as a guideline for your slides, and their content input system is clear and easy to learn. Still, we believe their mobile only approach could only take them so far and they’ve since been working on a web version of their platform that works for any computer. As we mentioned, the personal computer continues to be a much more efficient productivity platform. While the desktop version of Keynote is one of the best presentation software out there, their mobile version falls terribly short. It’s simple: adapting such a complex user interface to a tiny mobile screen is extremely hard, and we question if it should be done at all. We don’t see users going to their mobile phones to start building a presentation (unless they have no other choice) and we believe some significant improvements in the UX are required before that becomes a standard. While Keynote for iOS at least makes an attempt to remove some of the clutter from the interface, Microsoft just tried to cram everything up in your iPhone/iPad screen, from a full formatting bar to every single slide transition available on the desktop version. Also, while they advertise their application as Free, they do require an Office 365 subscription to move past the 30 day mark. While Android penetration is significantly higher than iOS market dominance, Apple’s OS remains the most profitable platform and often the first choice for mobile developers to launch their 1.0 apps. 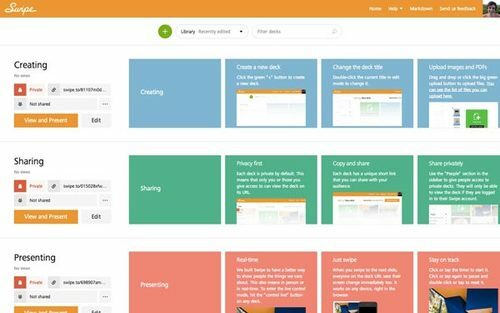 Google’s version of PowerPoint is hosted as part of the Google Apps suite, that you can access from Google Drive or from Google Apps for Work. Sadly, their presentation builder feels like a limited version of PowerPoint, with less features, limited fonts and very little customization options. Still, Google’s platform is available for free, has a lot of integrations and probably one of the best online collaboration systems out there. Check it out is easy, just visit your Google Drive. Presentation Maker is a popular Google Play application to build decks on your mobile phone. It’s a similar interface to the classic PowerPoint approach, but it falls short in terms of flexibility and especially on the design of the templates. More and more of the services we use on a daily basis migrate to the Cloud and presentations are not exception. There are a number of advantages when hosting a presentation on the web, from worldwide access to tracking capabilities. I recently sat in the green room of a conference and noticed the endless struggle of copying slide presentations from flash drives, ensuring that the videos work, that the formatting didn’t go mad and that the fonts are installed in the computer. It’s extremely inefficient and we haven’t improved this process in decades. More importantly, tracking the viewer’s activity on the slides, from the percentage of the presentation that they saw, to the amount of time spent on the slides- becomes an extremely valuable asset for investor pitch decks and for sales teams, when evaluating the real interest of their audience. We’ve classified these presentation tools based on the way they leverage the fact that they are based on the cloud, and the functionality that they provide taking advantage of being web based. 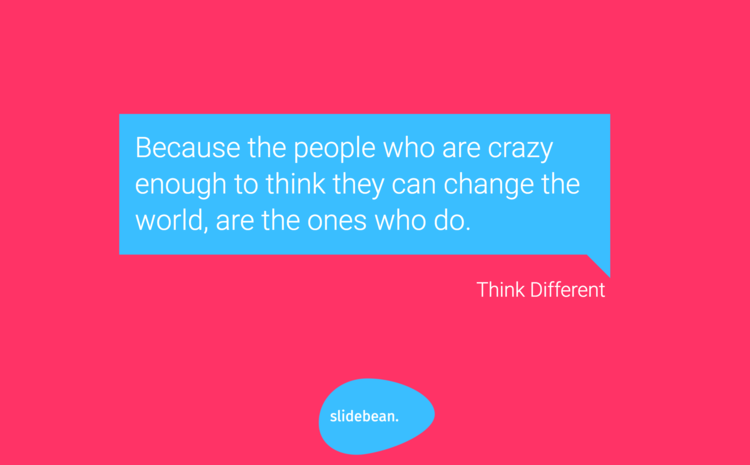 Slidebean is (by far) positioning itself as the best online presentation tool. With an innovative approach to inputting content, dozens of content templates and carefully crafted slide design, it takes just minutes to find out how efficient their approach is and how good your slides could look. 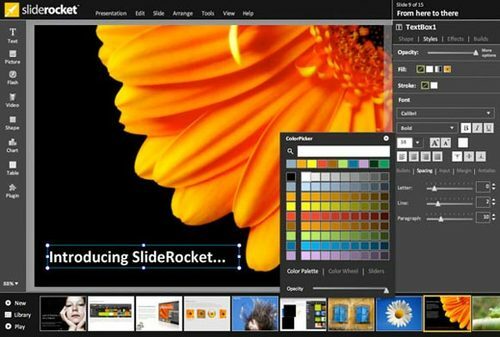 Slidebean lets you add the content, and automatically converts formats it into beautifully designed slides, so creating slides takes just a fraction of the time. 'Slides' is a nice website that lets you create and share presentations online. Formerly slides(dot)io and slid(dot)es, they finally settled for slides(dot)com. This startup was founded by Hakim El Hattab and Owen Bossola in Stockholm, Sweden, and it makes use of the reveal.js framework that we mentioned above. Slides has a nice web interface that encourages you to create a nice and clean presentations, however, it still depends on the user’s ability to manipulate the elements and arrange them in a nice style. Still, their pre-defined formats and their grid system help guide you to a better result. The platform also allows for custom HTML and CSS coding, which lets experienced users with coding skills, customize their templates even further. Some more info about them here. Final result: ★ ★ ★ ★ - Very Good! Prezi has been around for years and they have had a huge head start compared to any other online presentation tool out there. Their unique zoom styling makes it immediately obvious to the audience that they are looking at a Prezi deck. 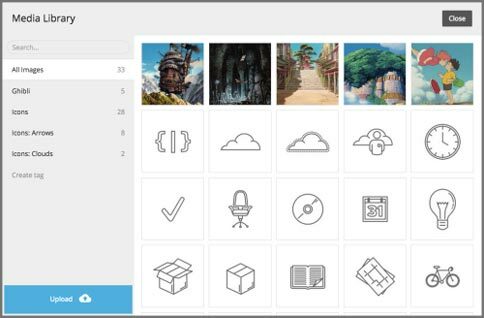 Prezi has the advantage of allowing you to create really stunning presentations if you know how to leverage their zoomable, infinite canvas. However, this can become a double edge sword if users overuse the feature and come up with a presentation that is literally capable of making people dizzy. Still, Prezi’s biggest weakness is on its ease of use. There’s a long learning curve towards dominating their interface and even if you do, you need to be a designer to make a great presentation on the platform. This is a huge company that is not going away anytime soon. With 50+ million users, they have proven the world wants and needs a PowerPoint alternative, and we have huge respect for them for doing so. Customization: ★ ★ ★ ★ - Very Good! Emaze is an Israeli company that was also one of the first players in online presentation software. They have a powerful web based builder that is as solid as PowerPoint and even includes a number of features that the Microsoft platform couldn’t even dream of having. Their branding and website image is bold and it grabs your attention quickly and some of their presentation templates are truly remarkable technical achievements. On the downside, their interface does require some learning curve and some of their slide templates end up being a bit over the top. Still, that doesn’t seem to stop their constant user flow. Swipe is a web presentation builder that works on Markdown, the popular web syntax. Their interface is super slick and they offer unique interactivity options, such as polls and surveys. We’ve been following swipe for a while now and have seen the way they’ve evolved their platform and gained their unique identity in this competitive space. The needs of presentation tools used in worship services are very particular. From the need to prepare lyrics to quickly importing Bible quotes, the tools used in churches must allow everyone from pastors to volunteers to collaborate, and should deliver results that help engage the church audience, from 100 to 1000 attendees. We’ve made this list based on the most efficient tools we could find, and the ones that more accurately target the needs for worship services. 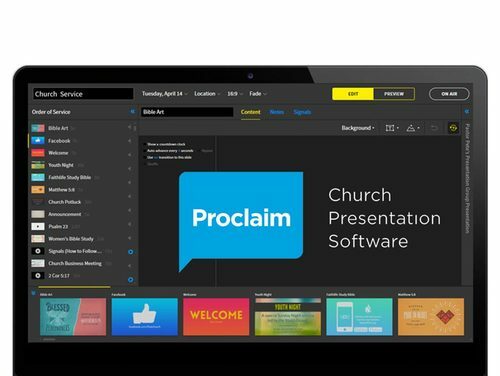 Proclaim is by far the best church presentation builder out there. They offer an easy to use interface, truly beautiful pre-designed elements for your slides and fantastic integrations like their on-screen bible, which lets you pull verse into a slide just by typing it. Additionally, they offer a remote app that you can use when presenting lyrics. The lyrics themselves you can pull from SongSelect (by CCLI) so you never have to type them again. 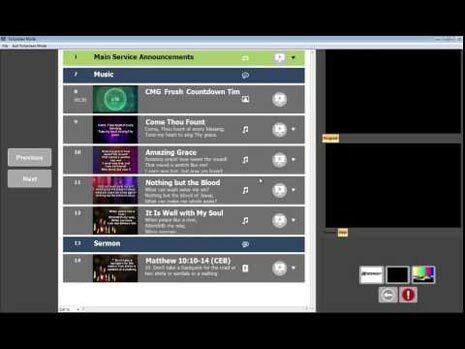 Media shout is much more than just a presentation builder, it integrates with a number of file formats to create a complete experience for your church’s service. From playing DVDs to touchscreen functionality, they go far beyond the classic PowerPoint functionality to become a complete suite to enhance worship in your church. I’m a graphic designer myself and I truly believe that good design helps transmit a more clear and effective message to your audience. I like to believe that there’s a new trend of presentation tools with a big focus on high-quality results. Until very recently, if you needed to create a high quality presentation you had to go to ODesk or Freelancer to hire an independent designer/consultant to design the slides for you, which makes the process expensive and extremely inefficient and honestly, ain’t nobody got time for that. The reality of today’s world is that technology and software should be handling the tough, design part of the presentation, and the user should be focusing on what matters most: the content. The following tools have a clear focus on design, they aid the user in creating beautiful slides and ensures that the final result is a professional, visual presentation. 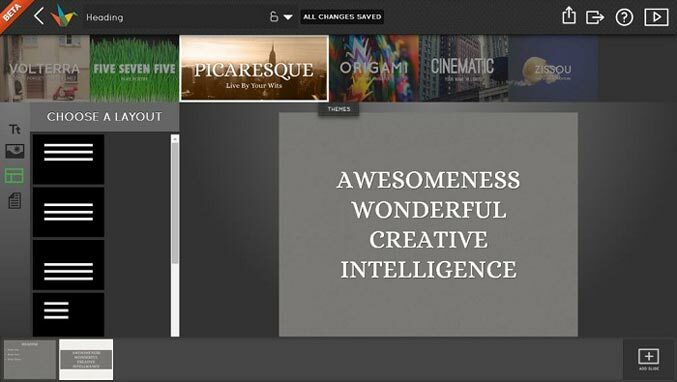 The premise of Canva is an ‘amazingly easy graphic design software’. 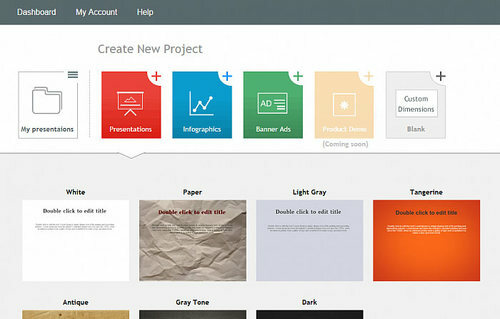 It lets you create anything from print design to banners and presentations. They provide an easy to use interface with a huge selection of pre-built designs that you can modify to your liking. These pre-built elements let you quickly draft a nice presentation even if you have no design skills, but it does require you to drag and drop and arrange the content of your slide, which can become time consuming. If an image is worth a thousand words, a video is worth a thousand images, quite literally as a matter of fact. This has created an increasing need to create video-presentations, otherwise known as explainer videos, that used to provide a quick, 3-5 minute explanation of a concept, an idea or a company. Traditionally, creating videos is a hard and very manual process that only trained professionals can manage; nevertheless, some companies have been working on making this process simpler and available to broader audiences. Creating a high quality video presentation will often require a LOT of time. There’s a very delicate balance between ease of use and customization, because the easier you make an application the more generic its results will be, and fully customized results will require more advanced tools that fewer users will be able to handle. The following list is in no particular preference order, the tool that works for you will really be defined by your needs and how savvy you are dealing with similar tools. Wideo is by far our favorite online video builder. They have an easy to use interface that will feel familiar if you’ve worked with PowerPoint before, with the big advantage that it lets you create professional animated videos that you can post online or even export to Youtube. The guys from Wideo have built a truly solid product that will work for both beginner and intermediate motion graphic productions. Balancing between ease of use and customization is a touch process. While Wideo favors usability, these products move to the other extreme and let you build pretty much anything you can think of. 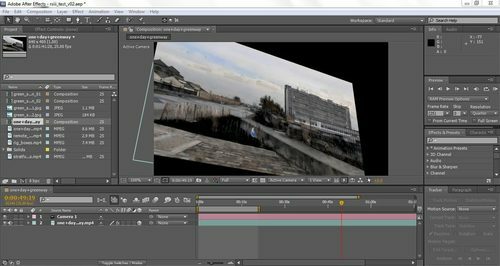 After Effects and Flash are, however, professional tools. I personally spent at least a year in my undergrad learning to use them and I still don’t consider myself an expert. If you are not a professional, keep reading. 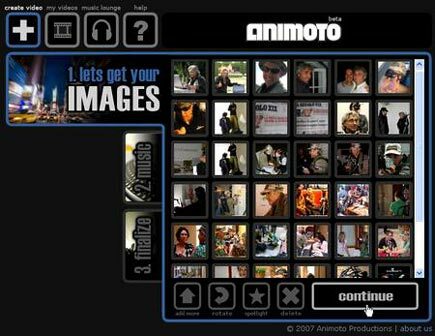 Animoto is a popular video creation tool which basically takes photos, videos and a song of your choice and turns them into a niece looking video, similar to what Slidebean does with presentation design. Their templates look pretty good and if you had to create a video similar to theirs from scratch, it could take hours of days if you used more traditional tools, so big kudos for their approach. 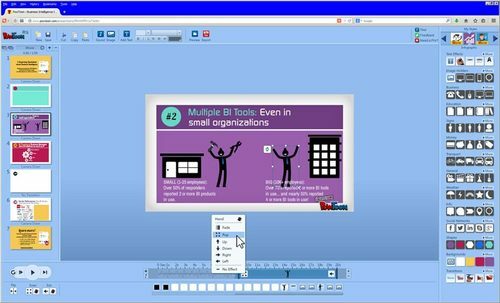 Powtoon provides a hybrid approach between presentations and videos with a clear focus in toon-styled animations, which are definitely eye catching. They provide you with a white canvas where you can import pre-animated elements to make up your video. Ease of use: ★ ★ ★ ★ - Very Good! Related Read: What should be in a pitch deck? Dave McClure’s Startup Viagra template, as well as Guy Kawasaki’s '10 Slides you need to pitch an investor' have become worldwide standards for the best practices startups need to follow to create and present a deck. Investors are used to evaluating startups using this format of slides, and some tools have done the task of implementing their practices into their software. More importantly, the ability to track presentation stats and find out if an investor saw through the whole presentation is significantly important for founders, because it can give them an inside track on their real interest in the company. 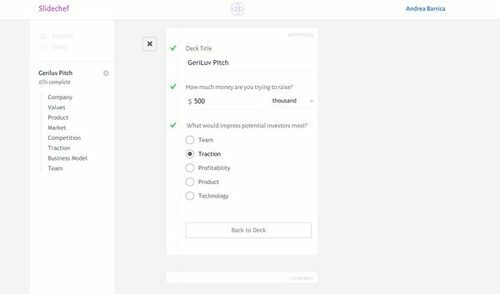 The following presentation tools are advertised as startup-focused, helping founders take their minds off the tedious part of building an investor deck, and allowing them to focus on what matters most: building great companies. If you are a startup founder you’re familiar with the need to constantly build investor decks. 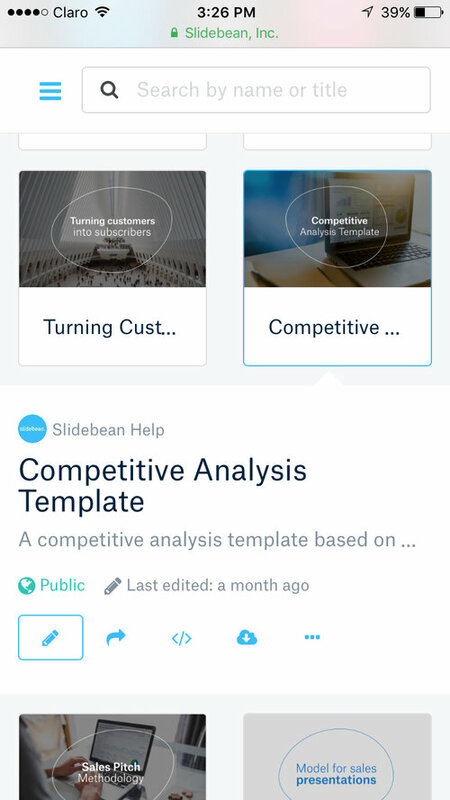 Slidebean has a large focus in startups and has dozens ofpre-filled decks that serve common purposes, like business proposals, investor pitch decks and investor updates. 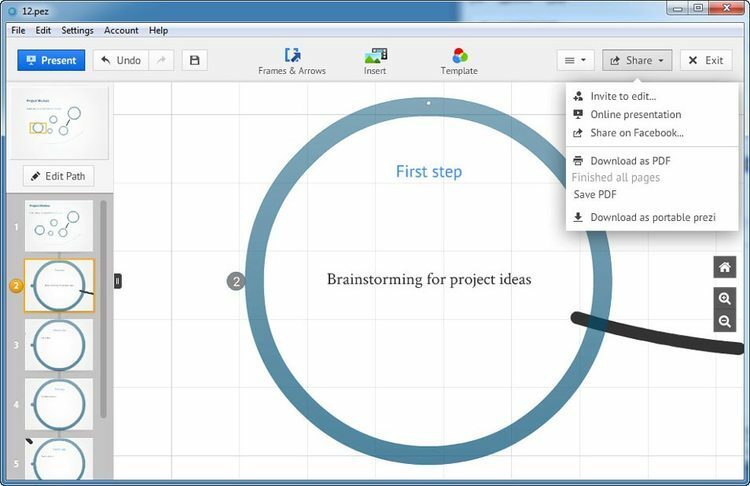 Slidebean lets you add the content and automatically converts formats it into a finished deck, saving you hours that you’d normally spend on PowerPoint. 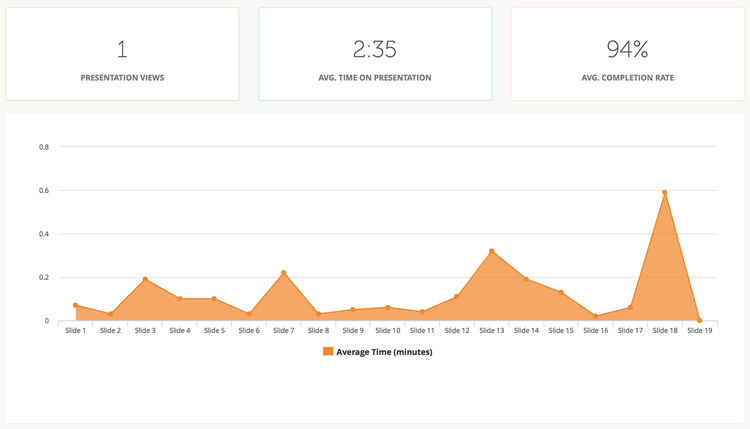 The platform also lets you track when, how many times and how much time your investor spent viewing your slides. Slide Chef is a neat application that automatically generates a presentation based on a small survey that gathers the key metrics from your startup. Filling the form out takes just a few minutes and the results are truly remarkable. The tools is currently in beta and the team hasnít announced a final launch date. When dealing with sales presentations, tracking the interest of your prospect customer is key towards optimizing your efforts and resources. The tools below have developed strong tracking algorithms to achieve precisely that. While some of them only provide tracking capabilities, Slidebean and Clearslide also provide professional a strong presentation builder. Clearslide has established itself as the key player in the sales presentations space. They focus on sales teams that are part medium to large businesses to optimize their presentations and their tracking. 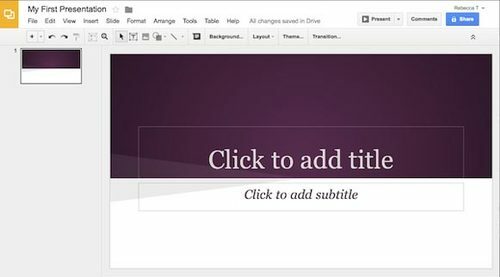 Slidebean lets you add the content and automatically converts formats it into a finished deck, saving you hours that you’d normally spend on PowerPoint. 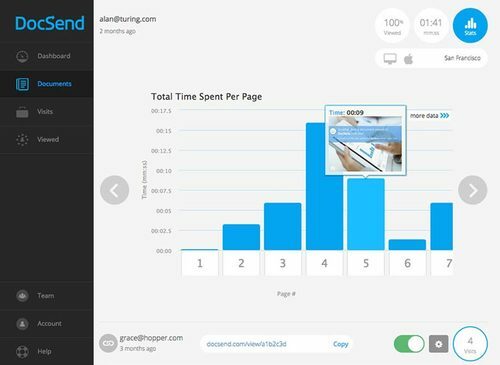 In September 2015, the team launched Presentation Insights, a solid presentation tracker that lets you track when, how many times and how much time your investor spent viewing your slides. Find more about Slidebean’s presentation tracking here. Docsend was build to track all sorts of documents, from text files to slide presentations. They focus on Sales teams, Startups, Business Development and Marketing teams and look to replace the need to send attachments with (traceable) Urls instead. Acquired by LinkedIn in 2010, Slideshare is the biggest presentation sharing platform in the world. If you are looking to get your slides discovered, make sure you place them here. After taking into account all the variables stated on the sections above, we’ve come up with a list of the best presentation tools in the market, accounting for ease of use, flexibility and final results as main drivers, and additional features like Cloud storage, integrations, compatibility and pricing as secondary score variables.